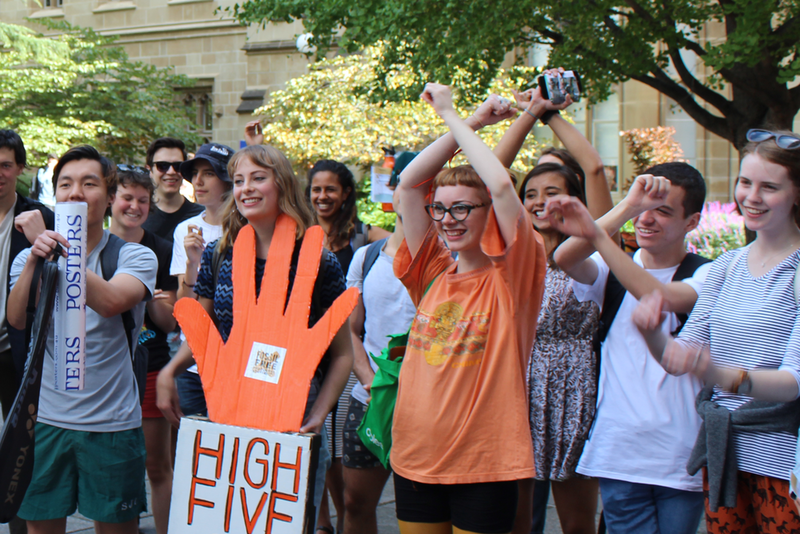 Lucy is a Bachelor of Arts student, majoring in Criminology and English, who jumped on the Fossil Free bandwagon back in 2014 and never looked back. She has had lots of different, challenging roles in her time with FFMU, such as being an Open Day climate guardian, Outreach Coordinator and naked roof protestor. She is passionate about good food, correct spelling and lots of colour and is one of the few peculiar people who genuinely love writing essays. Anisa has been a part of the the FFMU campaign since late 2014, and is absolutely loving it, from data entry to organising events to emailing university councillors! 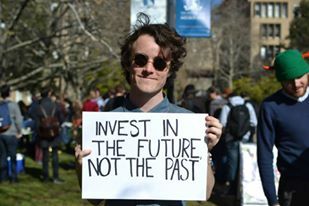 Luke is a science alumnus who, after learning about Melbourne Uni's ongoing investments in fossil fuel companies, became frustrated at the disconnect between what the university is teaching in the classroom and where they put their money. He joined FFMU in 2014 and now spends his time working in the grassroots organising team, enthralling students with enchanting tales about divestment theory of change, wrangling petition signatures outside of Union House and dropping fat beatz at FFMU rallies with his fully sick marching drum. Luke believes hectic basslines and fossil fuel equities should both be approached in a similar manner– ‘just drop it’. When Stas commenced her Master of Environment in early 2015, she knew that there was one group that she just had to be a part of. The Young Liberals wouldn't take her, so instead she joined Fossil Free. While not collecting petitions, writing emails and talking to all sorts about divestment, she enjoys brewing a perfect cup of tea, lying in the sun, riding in bike formations and dancing to old school tunes. Amber found her way to FFMU early 2014 when only speaking about climate change science seemed to make no difference. Amber likes to make waves through words; she jumped straight into the deep end and rallied staff to deliver a 108 strong academic open letter. Although she knows fossil fuels need to stay in the ground, no-one said anything about fossils and in her spare time Amber digs up fossils for research. 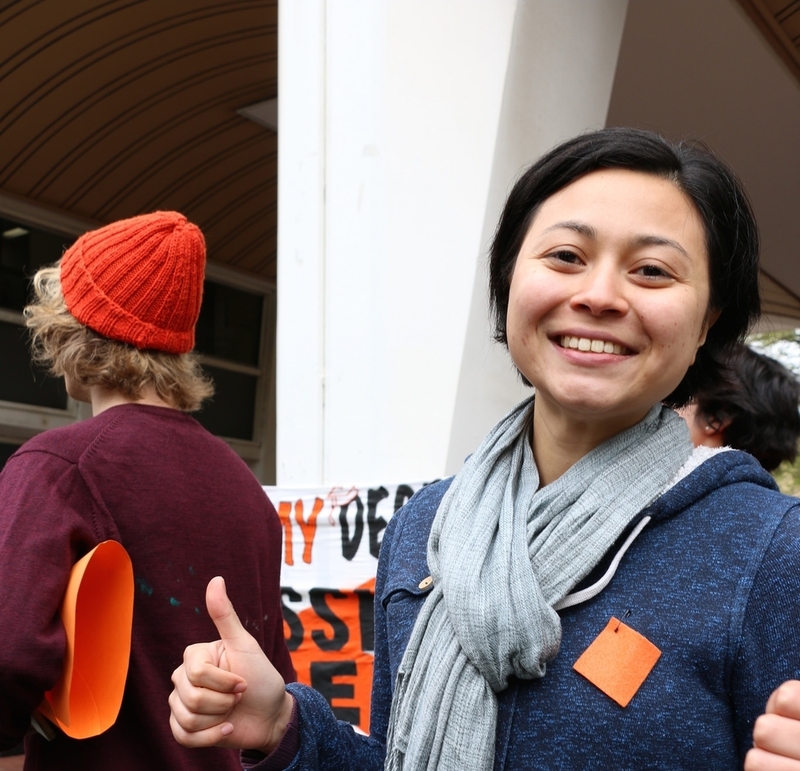 Spandana, Spandu to most, first caught the divestment fever in 2014 when she was new to University life. She has since been kept busy with the excitement and energy that comes with Fossil Free events and is an integral member of the Grassroots working group. She is in her final year of a Bachelor of Arts, majoring in Australian Indigenous Studies and hopes to find more intersections and pathways between grassroots environmentalism and Indigenous approaches, both past and present, in tackling all climate related issues on Stolen Land. Past UMSU Enviro Officer, chant leader extraordinaire. Jesse is an enthusiastic member of the grassroots team, and has a special love for community organising through music and food. Originally from WA, Jesse is slowly adjusting to the 20-year time difference (obligatory :P). She's studying a Master of Environment. Darcy is a beloved member of Fossil Free MU whose wit is dwarfed only by his passion for divestment. His commitment runs so deep that he would happily sacrifice friends and family for a future without fossil fuels... but will this be necessary? Hopefully not, and we are all working hard to ensure that this never happens. Member of Grasstops Working Group and owner of Roxy, adorable doggy mascot pictured in this image. Lizzie is also this years Enviro Officer! Angus was diagnosed with severe Environmentalism at the end of 2014. Originally thought to be a disease, Angus realised that the symptoms, including (but not restricted to) chanting, playing the harmonica at rallies, performing in divestment-themed musicals, and writing pithy emails to decision-makers, were a direct result of a clash of worldviews with his Commerce degree. Member of the Comms Team and graphic designer extraordinaire! Responsible for most of our posters and the like. Hailing from exotic Colombia. FFMU Elder. Vicky is a dog-lover, dodge-baller, twitcher and op-shop trawler. She was part of founding Fossil Free MU in mid-2013 and is still hangin' around. She now works for 350.org Australia supporting fossil free campus groups in Victoria. A hack and a spy, Matt has successfully infiltrated FFMU and has been leaking to Glyn for years. When he’s not conspiring with big Glynny D, he is a 'committed' member of the Grasstops team. Traditional media coordinator for the Comms working group, Aoife likes napping on southlawn and dislikes furniture. Her initiation to FFMU was getting her bum out on top of the old quad, read about it in the ‘news’ section. Phoebe is a member of the Comms Team! Check out her blog post on the 'news' section!